Mark your calendar! We are hosting a crawfish boil on May 5, and 100% of the proceeds benefit our Summer Program. 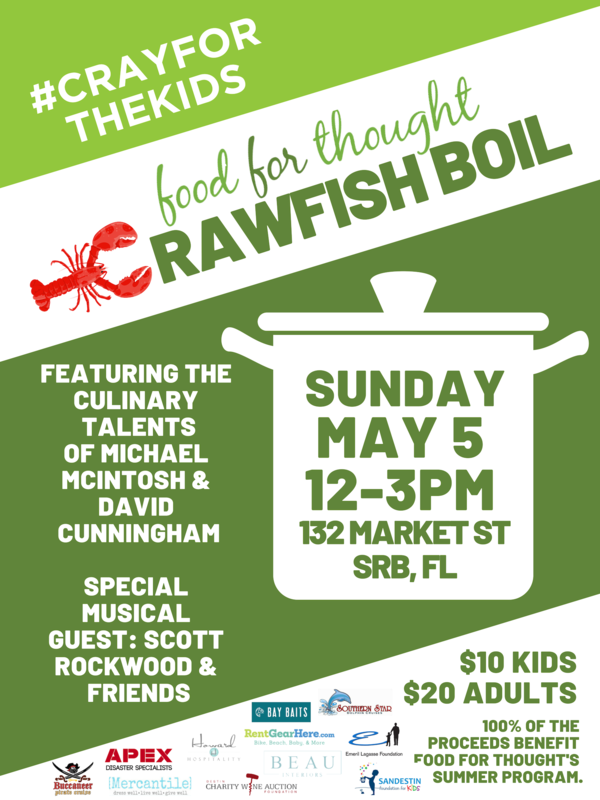 The event will feature the culinary talents of Michael McIntosh and David Cunningham, plus live music from Scott Rockwood & Friends. Students miss an average of 110 school-provided meals during this school break, so we serve 600 families in your community to help bridge this gap. Summer meals include family-sized boxes of pasta and sauce, mac & cheese, cereal, fresh fruit, snack items, and oatmeal. We include easy-to-open food items like soup, tuna, chicken, vegetables, Chef Boyardee, and Hormel Compleats. This is a fun and delicious way that #YouCanHelp these local kids during the summer months!